Roll clay to 1/4 inch thick using clay roller. Using needle tool or wooden skewer, slice into approximate 9” squares. Using needle tool or wooden skewer and circle template, cut out 9” circle of clay. Carve name of student into back of circle using needle tool. Using wet finger or damp sponge, smooth out edges of circle. Bottle tops, cups, spoons, wooden tongue depressors, etc can be used to make impressions on bottom half of clay circle to create feather detail. Fold over both sides of the circle for wings, pressing down carefully into place (score and slip not necessary). Fold over the top of the circle to create the head, scoring the clay and add a bit of water to create slip to help the two adhere together. Option: Place dowel under head so that it dries with a hollow area to place hanging cord. Add line details to wings. Using leftover clay, cut out a triangle for the beak. Score the back of the beak and the bird using the needle tool. Using wet finger, add water to scored bird head and wiggle beak into place until it feels firmly attached. Use a larger circle texture tool (cup, caps, etc) to create eyes. Student can add smaller circle inside eyes for more detail. Slightly pinch clay to form ears. Punch hole using straw in owl forehead or two on ears. Brush on color for center ring first and allow to dry (being careful not to get paint on outer ring, but don't worry too much about inner ring). 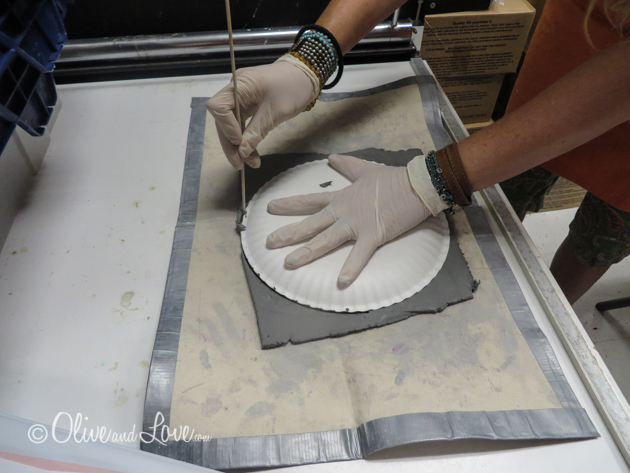 Brush on black glaze for center circle and allow to dry. Brush on clear over outer ring, it will go on blue but will dry clear. 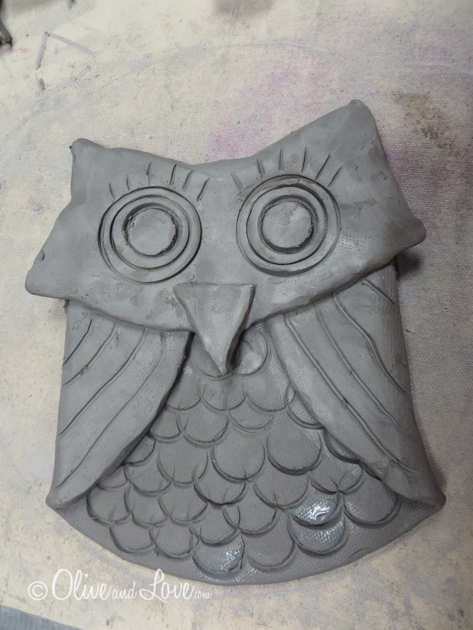 Brush on blue glaze over feathers and let dry. Wipe off using wet sponge, leaving blue glaze in grooves of feathers. Brush on clear glaze over all feather area.